Ashwin Sanghi is the much-lauded author of Chanakya's Chant (2010) and The Rozabal Line (2008). His new release The Krishna Key is again to do with history. On the IBN Live chat arranged today, he answered a couple of my questions, among many others. Q. What inspired you to write your first book? How difficult was it to write it all down on a day-to-day basis? How easy is it to write now, now that you are a published writer? 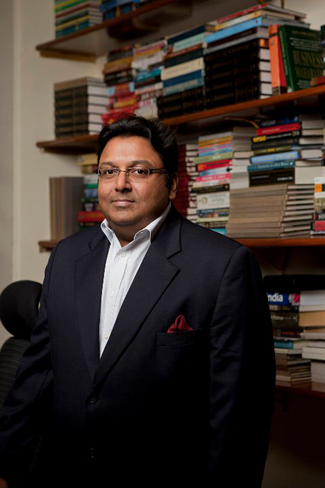 Ashwin Sanghi: My maternal grandfather was a voracious reader and poet who would send me a book each week to read. At the end of the week I had to send him a one-page letter about why I liked or disliked it. Up until 2005, I had remained a voracious reader without having any idea that there was a writer lurking inside of me. In that year I visited Rozabal—a shrine in the heart of Srinagar, which carries the legend that the person buried there is none other than Jesus Christ himself. I was fascinated by the story and began reading and researching everything that I could lay my hands on. Twelve months later, having devoured fifty-seven books on the subject, I had multiple theories swimming in my head. My wife casually suggested that I should try weaving the disparate threads into a single cohesive whole and that gentle nudge got me started on The Rozabal Line. The rest, as they say, is history. It wasn't difficult to write... I didn't know what I was doing. Challenges seem much less intimidating when you don't know what you're up against! When you are an unknown commodity, it's easier to write. Once you are known, your readership has expectations from you and this implies that you will always question yourself about whether it is good enough. Q. Would you consider writing something totally contemporary and modern as compared to the historical canvas of your works so far? Ashwin Sanghi: My next book is based upon an incident that happened in 1949. Most of the story is in the present day and there is very little history. So the answer to your question is yes.